For our valuable clients who find it difficult to chat with our “Tech Support” team. We hope this step by step article will help you to Live Chat with our 24×7 highly qualified Customer Technical Support team. Enjoy live premium chat support from both our Sales and Tech support team. Also we’re offering premium live chat support 24×7 round the clock even with our basic hosting plans. Live Sales Support: The team helps you get answers to any questions you might have regarding purchasing our cloud hosting or server plans. You can easily contact Sales Support by visiting our site and using the pop up live chat screen. That would be the orange tab at the bottom of your browser screen. Customer Technical Support : This is offered only to customers who are already using our services. You can easily gain access by logging into your Client Area. Generally this will be Email (the email used to purchase our hosting services) & password. We request our customers to directly contact the Customer Technical Support chat instead of Sales Support. By chatting directly with Tech Support, all your technical issues are resolved immediately. This is the fastest way besides submitting a ticket to tech, in resolving any technical issues you might be facing. The client area can be very useful as you can check on invoices, payments, account information and support tickets etc. Thus you can say it’s a one stop solution for support from our team. Please note that the Client Area credentials may sometimes differ from the cPanel. This could be due to customer preference. cPanel is directly related to your personal Site & Data Base. On the other hand, Client Area connects you with the hosting provider. In this case, Aspiration Hosting!! 1. First use your browser to visit the Aspiration Hosting homepage. 2. Once there, on the very top left side, beside the orange “Sign up” button, you will see “Client Area Login” link. 3. Now click to visit the login page. 4. 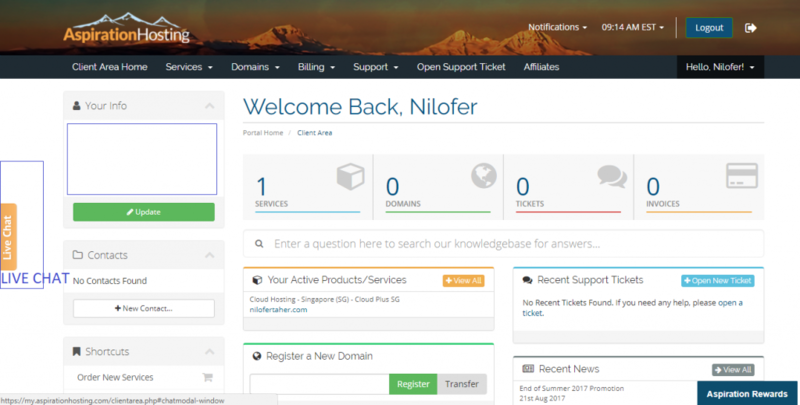 In the new screen, enter your credentials that have been provided when you registered with Aspiration Hosting. If however you have forgotten the details, click Forget Password. As a result an email will be sent with your login details. Please also remember the reset password email will be sent only to your registered email address. Make sure you have access to this email account. If for some reason you are unable to access your registered email account. Please contact the billing department. They will guide you further on how to change your registered email. Also if you are a webmaster or a developing company hired by an Aspiration Hosting customer, please ask them to add your email address as additional contact in the Client Area. 5. 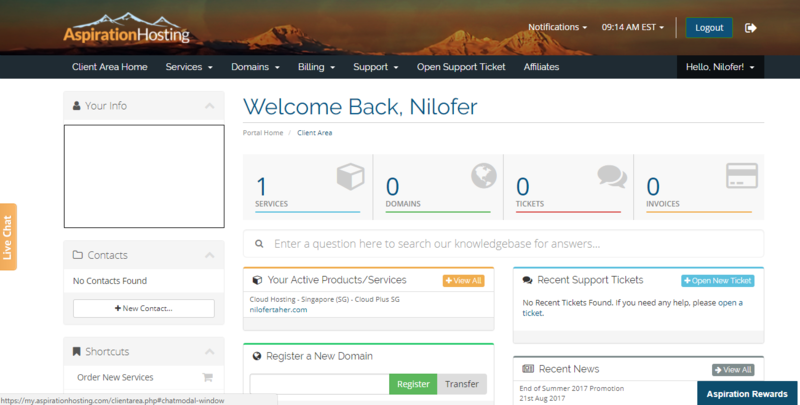 By logging in, a new Dashboard will open in front of you. 6. 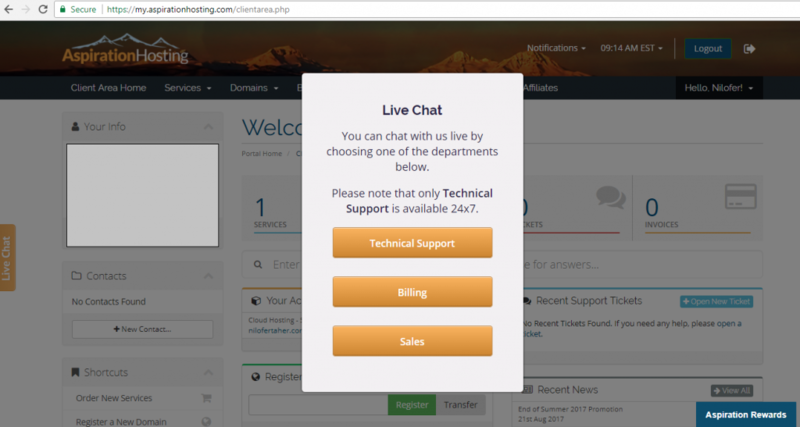 On the left hand side of the screen, you will see an orange tab marked area named as “Live Chat”. 7. Simply click on the tab to open the chat option. From here you can contact Technical Support, and also the Billing Department and the Sales team. The very first option you will see is “Technical Support” tab. Click that tab. 8. Now a second widow will open beside it. It will look like a form. Just click “Start Chat”. There you have it. You are now Live chatting with our Technical Support team. Remember you can also submit a ticket to the tech department from the very same Client Area. Our Technical team is always available 24×7, all year round for further assistance. Thank you for being part of Aspiration Hosting!! !